ATLANTA, Georgia (CNN) -- An enormous Asian elephant stepped out from behind a big red curtain at the Ringling Bros. and Barnum & Bailey Circus in Atlanta, Georgia. 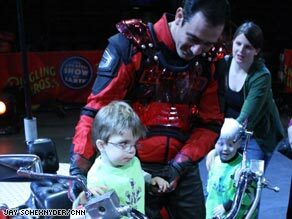 Eli Hummer, 3, gets to try out an oversized motorbike at the circus. An audience of 20 pre-schoolers clapped and squealed as the elephant was handed a tiny harmonica and started playing. But, instead of sitting far away in the stands, the children, all visually impaired, were just a few feet away from the action. Among them was 3-year-old Eli Hummer. "He doesn't see, so to learn about it, he has to touch it and be close to it," explained his mother, Martha Hummer. She said being able to use the sense of smell, touch and sound helps her son understand the concept of a circus. Every year as it tours the country, Ringling Brothers sponsors a "Blind-Touch Tour" in about a dozen cities. Eight stations were set up where children could touch and try on circus costumes, play with giant umbrellas and butterfly wings and sit on an oversized motorcycle. Clowns roamed the ring juggling and trying to make the children laugh. Eli responded by trying to pull off the ball-like prop. His teacher, Joyce Burnett, who is also visually impaired, spent two weeks before the circus visit preparing the kids in the classroom for the unique experience. "We had clown shoes, a nose and a wig and we tried all of those on," Burnett said. She said the students also listened to elephant sounds and drew the outline of the animals with chalk. Michelle Singleton, mother of 4-year-old Miya, said the experience is something the kids can't get anywhere else. "The fact that she's on the floor now, she is really excited. She wanted to see the elephants so she's happy now," Singleton said. Four-year-old Kristina Masta was fascinated with a trapeze swing that was hanging low to the ground. One of the performers helped the girl climb on while her mother, Michelle Masta, stood nearby. "Because of her visual impairment anything that is highly tactile and brightly colored helps out a lot," Masta said. Her daughter weighed 1 pound, 1 ounce at birth and suffers from retinopathy of prematurity, a disease in which the small blood vessels in the back of the eye grow abnormally. Masta said other people may not realize the limitations and challenges of having a visually impaired child. "Everything is ten times harder," she said. Masta smiled as her daughter handed her a rainbow-colored lollypop to unwrap. "The kids feel special because they get to actually do something that the other kids don't do, and it is a real treat," Masta said.